Colonel Lonnie Westphal, Ret. and Colonel Matthew Packard, Chief of the Colorado State Patrol, cordially invite you to participate in the Twenty-Second Annual Colonel’s Challenge Charity Golf Tournament, to be held on Thursday, August 22, 2019 at Sanctuary Golf Course. Colorado State Troopers risk their lives every day in an effort to make Colorado safe for all of us. Their sacrifice is especially significant as the risk to their well-being continues to grow. In 1998, then Chief of the Colorado State Patrol, Colonel Lonnie Westphal, started a new fundraiser for the Colorado State Patrol Family Foundation – the Colonel’s Challenge Charity Golf Tournament. This was the beginning of many partnerships between the Foundation, companies and individuals to support Colorado State Troopers and their families. You, too, can show your support for officers who have made the ultimate sacrifice by playing golf on one of the most beautiful courses in the world and/or by being a tournament sponsor. Over the last twenty-one years, nearly $1,800,000 has been raised by the very generous supporters of this tournament and it is greatly appreciated by the Foundation! All proceeds of the tournament benefit the Colorado State Patrol Family Foundation, which provides educational and financial support to the children of fallen Colorado State Troopers and Troopers who are seriously injured in the line of duty. The Foundation also assists Troopers and their families in times of financial hardship and awards college scholarships to those pursuing a higher education. The Foundation has been lucky to host this tournament each year at the Sanctuary Golf Course in Sedalia, Colorado. This luxurious course is owned by Dave and Gail Liniger, the founders and owners of Re/Max International. Sanctuary is played exclusively by invitation or through one of the approximately 25 charity events hosted annually. 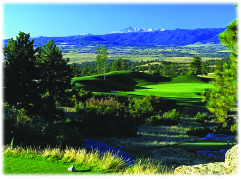 It is known for its elevated tees, towering pines and 180-degree mountain views encompassing Pikes Peak to the South and Longs Peak to the North. Because of the dramatic terrain, a foursome typically feels the entire course is theirs – even when play is at capacity. Five sets of tees invite every level of play. Player fees include 18 holes of golf, cart, range balls, brunch prior to play, awards banquet dinner at completion of play, pro-shop gift certificate, and other gifts. Prior to play, a putting contest with prizes will also be held. Play is a modified scramble: Each player hits a drive, the best drive is selected and then each player plays their own ball to completion. The two lowest scores are added together for the foursome team score. There will be prizes for the longest drive, closest to the pin, longest putt and other contests. All team and event sponsors will be recognized for their support. Tournament Supporters will receive special recognition, as well as those who sponsor brunch or dinner. Signs will be posted on the golf course for all hole sponsors. Registration and payments may be processed online or through the mail. To pay online via credit card, click here. Please do not hesitate to contact us if you have any questions. Lonnie and Annette Westphal can be contacted directly at 303.549.2145, amdwestphal@yahoo.com, or the Foundation can be contacted at 720.269.4046.